Clean, updated one bedroom apartment with office (or second bedroom) for rent in four-unit home on quiet street. Unit is on the top (3rd) floor and includes a great front porch/deck. Close to parks, stores, public transit and schools. Plenty of storage space. $1100 monthly rent includes radiant heat, water and trash. Tenant pays electricity, gas, phone and cable. Unit is cable-ready and has window air conditioning. Fresh paint, kitchen tile and new carpeting. Updated electrical and plumbing. Bath has an original clawfoot tub. Plenty of kitchen cabinets, clean refrigerator, dishwasher and gas stove. Coin laundry in basement. 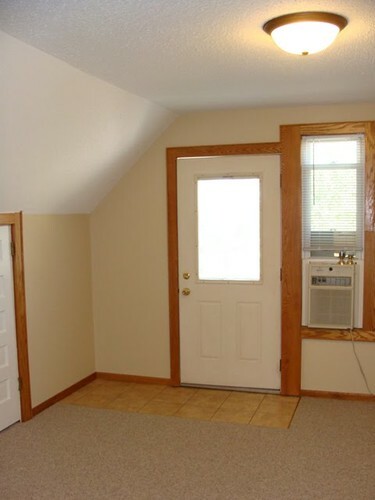 Basement storage unit and one off-street parking spot included. Responsible landlords live in the neighborhood. $1075 security deposit. $40 application fee to cover credit and background check. References required. No smoking, no pets. Home is at the corner of Edgerton St and Jessamine Ave on Saint Paul's East Side (Payne/Phalen neighborhood). Unit is available Jan 1 - rent can be pro-rated if move-in is not the first of the month. 12 month lease. · Landlord’s insurance does not cover tenant’s property. Tenants are encouraged to secure renter’s insurance. · Tenant may pay rent via check to landlord or make direct deposit to bank. Rent is due on the 1st of the month, there is no grace period. · No smoking inside the property or within 15 feet of an open window. · No large containers of water without written approval from landlord – this includes water beds, fish tanks, etc. · No pools in the yard with the exception of small baby pools that must be drained after each use. · No painting, wallpaper or home improvement projects. · No nails or screws in walls without written consent of landlord. · Notify landlord immediately with safety concerns or if repairs are needed or suspected. · Keep the home in clean condition so as not to attract insects or rodents. Notify landlord immediately if extermination may be necessary.